የዳንኤል እይታዎች Daniel Kibret's views: ዝቋላ ሀገሩ የት ነው? የአንድ ክልል የቱሪዝም ቢሮ አንድን ገዳም ነጥቆ በገዳሙ ሥርዓት የማይፈቀድ ሌላ እምነትን ለመተካት ማነው ሥልጣን የሰጠው? በዚያ ገዳም ክልል ውስጥ ሊከበሩ የሚገባቸው ሃይማኖታዊ በዓላትንስ በምን ቀኖናዊ ሥልጣኑ ነው የሚወስነው? ለምንስ ነው እነዚህን መነኮሳት እየጠራ የሚያስፈራራው? ይኼ ገዳምኮ ዘመናትን ሁሉ ተሻግሮ እዚህ እንዲደርስ ያደረገው በእምነቱ ጽኑ የሆነው የአካባቢው የኦሮሞ ተወላጅ ነው፡፡ ሕዝቡ እዚያ ገዳም ለጸሎት የተጉ መነኮሳት እንደሚገኙ፣ የአቡነ ገብረ መንፈስ ቅዱስ የቃል ኪዳን ቦታ እንደሆነ የሚያምን ነው፡፡ በየዓመቱ በጥቅምትና በመጋቢት 5 ወደ ቦታው በመሄድ የአቡነ ገብረ መንፈስ ቅዱስ በዓል ከሚያከብረው ሕዝብ አብዛኛው የአካባቢው የኦሮሞ ተወላጅ ነው፡፡ ታድያ እነዚህ አካላት ይህንን አስተሳሰብ ከየት አመጡት? ይኼ ተልዕኮ ሃይማኖታዊ ተልዕኮ አይደለም፡፡ የጠብ ጫሪነት ተልዕኮ ነው፡፡ በሰላም የኖረውን ሕዝብ የማበጣበጥ ተልዕኮ ነው፡፡ መጋቢት 5 ቀን በአቡነ ገብረ መንፈስ ቅዱስ በዓል ‹ኢሬቻን በጠበሉ ቦታ እናከብራለን፣ ሐውልት እናቆማለን› ብሎ በሕዝብ መገናኛ ማወጅ ጠብ ያለሽ በዳቦ እንደማለት ነው፡፡ ማንኛውም ሰው ያጸድቀኛል ብሎ ያሰበው እምነት ሊከተል ይችላል፡፡ ሁለት እምነቶች ግን በአንድ ቤተ መቅደስ ሊመለኩ አይችሉም፡፡ ሁሉም የየራሱን ነው መከተል ያለበት፡፡ ‹ከባልሽ ባሌ ይበልጣልና አልጋሽን ልቀቂለት› የሚለው ብሂል ግን ዛሬ የሚያዋጣ አይመስልም፡፡ የሃያ አንደኛው መክዘ ኢትዮጵያንም በጤና አውሎ አያሳድራትም፡፡ በዝቋላ ገዳም ላይ የተጀመረው ርስትን የመንጠቅ ሥራም በዝቋላ የሚያበቃ አይሆንም፡፡ ‹መንግሥታዊ ሃይማኖት የለም› ከተባለ መንግሥታዊ መዋቅሮች አንድን እምነት ደግፈው ሌላውን እምነት ለመጫን እንዴት ቻሉ? My parents are from Oromo background but never had this type of complete and utter hate for other people or their religion. This comes from their bosses - woyane- and their dictatorial, tyrant rule. 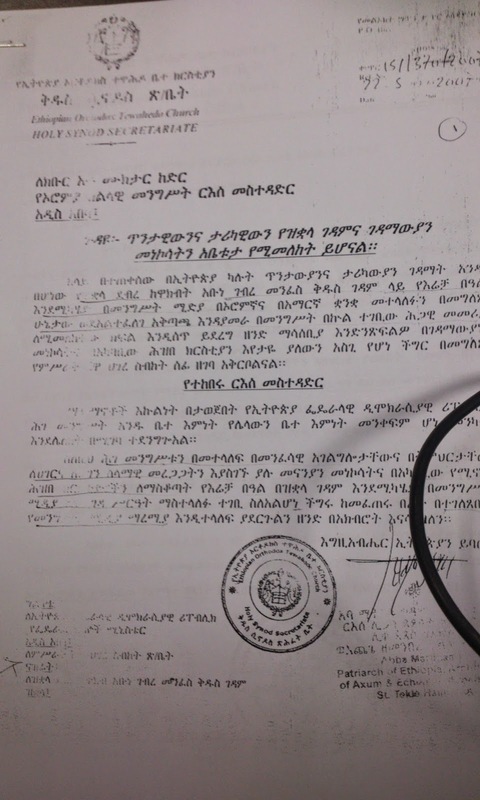 This drives me crazy and believe me this is not going to end well for the "menekosat" in the gedam. They will not hesitate to massacre anyone who stands in their way. Is there anything we can do as EOTC members? Thanks for sharing. Is there NOone with little wisdom in the government? God bless u,eagle eye Daniel!---every one has to understand that making a kios in Eth Orthodox church has been started since the inception of TPLF. By cracking down the unified religion, this group is calculating its eternal power on this nation!---Pray and unification are the two weapons to stop this junta! አሁን ነገሮች እየተፋፋሙ መጥተዋል፡፡ የግብጽን ክርስቲያኖች ኑሮ ሳስብ እንዴት እንደሚጸኑና እነደ በግ በተኩላ እየተበሉ መኖራቸው ይገርመኛል፡፡እነርሱ በሃይማኖት አይቀልዱም፡፡እኛም ወደዚያው እየሄድን ነው፡፡የአሕዛብ ዘመን መጥቶአል፡፡ በአሕዛብ እየተዋጥን ነው፡፡ ወገባችሁ የታጠቀ መብራታችሁ የበራ ይሁን፡፡ ክርስትና በደም ላይ ነው የተመሠረተው፡፡ ለዚች ሃይማኖት ለመሞት የሚዘጋጁ ብጹአን ናቸው፡፡ የአባቶችን ርስት ለማስከበር የሚሞቱ ብጹአን ናቸው፡፡ዝÌላ የኢትዮጵያ ዓይን ነው፡፡ በዓይን ደግሞ ቀልድ የለም፡፡እ/ር የፈቀደለት ይዘጋጅ፡፡ ያለርሱ አጋዥነት ሰማዕትነትን መቀበል ስለማይቻል፡፡አቡነ ጴጥሮስ በጣልያን የተገደሉት ለዚች እምነት ብለው ነው፡፡ አቡነ ተ/ሃይማኖት ጣዖት አምልኮን ለማጥፋት ብዙ መከራን የተቀበሉት፤ አቡነ ገ/መ/ቅዱስ መቶ ዓመት የጸለዩበት ሐይቅ በጣዖታውያን ይደፈራልን ይህ እ/ር የእኛን አÌም ለመለካት ያመጣው እንጂ ለሌላ አይደለም፡፡የብሔር ነገር ከተነሳ እኔም ኦሮሞ ነኝ፤ ግን ሁሉም አሮሞ በእሬቻ፤በገዳ ስርዐት፤በጫጩ፤በከለቻ፤በአቴቴ፤በቦረንቲቻ፤በመልካ፤በቃሉ፤ወዘተ.ያምናል ተብሎ አይታሰብም፡፡ የእኛ አያቶች በዚያ መንገድ ተጉዘው ሊሆን ይችላል፡፡ የኔ አያት በወንዝ ታመልክ ነበር(ባለማወቅ)፡፡ አሁን ደግሞ ሰለጠንን የሚሉ በውሃ አናመልክም፤ውሃውን በፈጠረ እንጂ እያሉ ሞዲፋይ እያደረጉ በ40 በ80 ቀን የተጠመቀውን ሕዝብ ግራ ያጋቡታል፡፡ ስለዚህ የጭንቁ ቀን ብቅ እያለ ስለሆነ እንዘጋጅ፤ሃይማኖታችንን ነቅተን እንጠብቅ እላለሁ፡፡እነዚህ የአክሱም ነገስታት ልጆች ምንም አይሰማቸውም? አንተ ደደብ ስለ ኦሮሞ ህዝብ ባህልና ሃይማኖት ስርኣት ኣንተ ብቻ ኣይደለህም በዚህ መልኩ የተነተንከዉ፡ቅድመ አያትህ አባ ባህረም ያንተው አይነት አቋም ነው የነበረው፡ኤና ያንኑ አራውታዊ ትችት ነው ኢየበረቀስክ ያለሀው፡የጣኦት ባለ ሀብቶች ማን አንደሆኑ ራስክ ታቀዋለህ፡፡ You z evil-mided! ዲ/ን ዳኒኤል በጣም እናመሰግናለን፡፡ በታም ጥሩ እይታና አስተያየት ነው፡፡ አንዳንድ የመንግስ ባለስልጣናት ያለ አግባብ የሚሰሩትን እኩይ ተግባር ማጋለጥ አስፈላጊ ነው፡፡ አሁን ዝም ብለን ከተመለከትን በኋላ ቤተ ክርስቲያን አፍርሰን ለሌላ የዕምነት ተቋም እንሰጣለን ማለታቸው አይቀርም፡፡ ለታሪካዊቷ ቤተ ክርስቲያን እየተሰጠ ያለው ግምት ዝቅ ከማለቱም በተጨማሪ ድፍረት በተሞላበት ሁኔታ መብቷ እየተገፈፈ ነው፡፡ ይሄ መቼም ፖለቲካ ነው ማለት አይቻልም፡፡-አላዋቂነት እነጂ! ለማንኛውም የሚመለከታቸው የቤተክርስቲያን አካላት አስቀድመዉ ባይሠሩም ዛሬ ከእንቅልፋቸው ከነቁ የሆነ ነገር ቢሉ፡፡ እርግጥ እነርሱን ይሄ ያሳስባቸዋል ወይ የሚለው ይያቄ ነው፡፡ ---የሌላ እምት ተከታዮች ስለወረሩት ምን ይደረግ፡፡… አይ ቤተ ክህነት…ቤተ ትክነት ከሆነ ዋለ አደረ! its very sad to hear this story. when we close one door they will wait us on another one just to attack. i don't understand the difference between politics and faith. may GOD give us all the courage and strength to overcome this terror. Great Job Your Holiness Abune Mathias! !ማኅበረ - መነኮሳቱና ቅዱስነታቸው ያሳዩት ቁርጠኝነትና ችግሩን በሰለጠነ መንገድ ለማስወገድ የሄዱበት አካሄድ የሚመሰገን ነው፡፡ድርጊቱ ቢያናድድም እኛ ድርጊቱን ከወጠኑት መሻል አለብን፡፡በአስተየያታችን ውስጥ ፖለቲካዊ አድሏዊነት አይንጸባረቅ፡፡አጀንዳውን የኖረ የፖለቲካ ሂሳብ ማወራረጃ አናድርገው፡፡ከተቋማችን ጋር እንቁም፡፡ኤሬቻ ላይ እንደተቋም ተቃውሞ እንደሌለን በስራ አስኪያጅ ደረጃ የሚገኙ የኦሮሞ ተወላጅ የሃይማኖት አባቶችን ጭምር በመላክ ገልጸናል፡፡ያ ማለት ግን በዐሉ በኢኦተቤክ ቅድስና የተሰጠው ነው ማለት አይደለም፡፡ሌሎች ሃይማኖችም ቢሆኑ ስለኢሬቻ ከእኛ የተለየ አቋም የላቸውም፡፡አይቃወሙትም፡፡አያከብሩትም፡፡ስለዚህ ኦርቶዶክሳዊት ቤተክርስቲያንን ነጥሎ መፈታተን አጓጉል የአክራሪ ብሔርተኛነት መገለጫ እየሆነ ሀገራዊ መግባባትን እንዳያውክ መንግሥት የበኩሉን ድርሻ መወጣት እንዳለበት ይሰማኛል፡፡ሰላም!!!! ‹መንግሥታዊ ሃይማኖት የለም› ከተባለ መንግሥታዊ መዋቅሮች አንድን እምነት ደግፈው ሌላውን እምነት ለመጫን እንዴት ቻሉ? Really, are they Humans? this time is not different from the time of Yodit Gudit and Gragn Mohamed!! wey wayane (EPDRF) menew melkam neger alerjik honebachu!!!!!!!!!! የኢትዮጵያ መንግስት ISIS ን መደገፍ ጀመረ እንዴ? This issue is not passed as a previous ones . The govt part and the church should work to alleviate the problem and also the political parties pls inform your members that " democracy is not about a place . But it is all about people and diversity "
Closely working with the surrounding community to consider institutions like the one under discussion as its own institutions shall be considered as one of the strategies to overcome such problems in the long run. Here, to closely work with the community, working on the notion that relates the EOTC to the totalitarian monarchy system and means of oppression particularly in the South needs serious attention along with respecting rights of people in the area that follow the traditional beliefs through assigning well educated, multilingual and matured Scholars of the church in such sensitive areas. 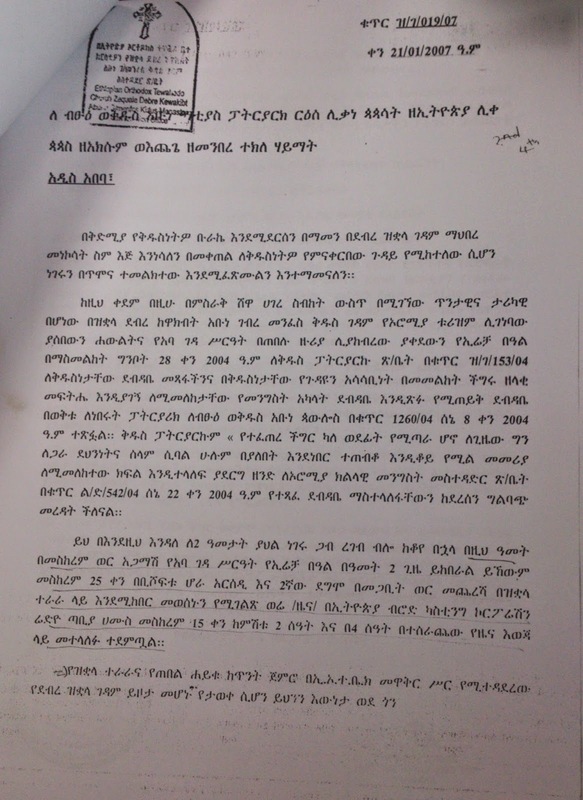 Guys, please read this intersting article from Abune Gebremenfes Qidus. የሚያሳዝን ጊዜ ደረሰን. እንግዲ ሁላችንም ሰምተናል ሥሜታዊ ባልሆነ መንገድ መፍትሔ መፈለግ አለብን.ወቅቱ የአብይ ፆም ወቅት ነው . መድሃኒያለምን የመጣውን እሳት እንዲያበርደው ተግተን እንፀልይ. በመቀጠልም ቤተ ክህነት ከሚመለከተው ክፍል ተነጋግሮ ጊዛዊ ሳይሆ ቂሚ የሆነ ወይንም ድጋሚ እንደዚ ዓይነት አሳብ እንዳይነሳ ማድረግ መቻል አለበት. በቅዱሳኑ ፀሎት እኮነው ዛሬ ያለነው. የሚመካ ቢኖር በእግዚሃብሔር ይመካ ነው የሚለው ቅዱሰ ወንጌል. ሰለ ኢትዬጵያ አንድ ሆኖ ማሰብ ነው ያለብን. በዘር, በገንዘብ,በሰልጣ ....መመካት ውጤቱ ባዶነት ነው. መጨረሻውም አያምርም. ወደ ልባችን ተመልሰን የተቀደሰ ሥራ ሰርተን እንለፍ. ዲያቆን ዳኒ ከአገር ውጭ ላላን በምን መልኩ መርዳት እንዳለብን የሚመስልህን አሳብ እባክህን ጠቁመን. አሁን ነው ዝምታ ወርቅ አይደለም ማለት. አምላከ ቅዱሳን ቤተክርሥቲያናችችንና,ኢትዬጵያን ጠብቅ! እመብርሐን አሥራት አገርሽን ኢትዬጵያን አስቢ አሜን!! !ዲያቆን ዳኒ እመብርሐን አትለይህ አሜን! ለመሆኑ ዲ/ን ዳንኤል ይህንን ዕኩይ ጸባጫሪነት ከዚህ ባለፈ ለመቃወም ለመጋቢት አቦ ክብረ በዓል ያሰብከው እንደተጠበቀ ሆኖ ምናልባት የተቃውሞ ፊርማ ማሰባሰብና ለሚመለከተው አካል ማቅረብ ያስፈልግ ይሆን? ፈጣሪ ክፉውን አርቆ ቸር ወሬ ያሰማን!!! We all believe , you are our voice. Please push hard to make this stupid idea get rid off. We cant blame the government for everything happen back home, but we the people have to team up and change the difference. Thank you Daniyee. ዐይንህን ክፈት እስኪ! !አቤቱታውን ለፓ/ኩ ያደረሱት አቡነ ጎርጎርዮስ ትውልዳቸው ትግራይ ነው፣የአቡነ ማትያስንም ታውቀዋለህ! !ሃይማኖቱን የአማራ ብቻ አስመስለህ ያላዋቂ ሳሚ አትሁንብን! !ስንትና ስንት ተቋማትንና ደቀመዛሙርትን ያፈሩትና በደርግ እጅ ከመጋዝ ጀምሮ ከሀገር-ሀገር እስከመሳደድ የደረሰ ሕይወት ገፍተው በክብር ያረፉት አባታችን አቡነ ጳውሎስ ደግሞ በእንደ አንተ አይነቱ አማተር አፍ ስማቸው ሊዘነጠል አይገባም፡፡ይከብዱኃል! !ዳሩ ምን ታረጉ "ስማችሁ የለም" እያሉ አባቶችን ደፍረው የሚያስደፍሩ እነ ዳንኤል ክብረት ናቸው!! ህም! !መድረኩን አንቦርቅቀው አባቶችን መዛበቻ ማድረግን ጌጥ አድርገውታል! !ህም!ተቆርቋሪነት በስድብ የሚገለጽበት ሃይማኖት የእኛ ብቻ ሳይሆን ይቀራል! !ባለንጀራው ቢያሸንፈው እልሁን በሚስቱ እንደተወጣው ባል ምድረ-ትምክህተኛ ፖለቲካው ሲያቅትህ ቤ/ክ ተጠልለህ ትቦጠልቃለህ፡፡ቆይ!! ስማ! !አባ ገብረ እንድርያስ የተፋለመው አማራጭ ስላልነበረው ነው፡፡እኛ ደብዳቤያችንን ጽፈን በክብር የተቀበለን ኃይል አለ፡፡የእሱን መልስ ሳንሰማ ካልተሰዋን-ካልተቀላን ማለት ጦር አውርድ መሆን ነው፡፡ዝም ብላችሁ አጋጣሚ እየጠበቃችሁ ተደብቆ የማይደብቅ ዘረኝነታችሁንና ፖለቲካችሁን አትደርድሩብን፡፡የትግራይ ኦርቶዶክሳዊነት ከአማራም ሆነ ከሌላው ብሔር ኦርቶዶክሳዊነት ያነሰ አይመስለኝም፡፡ወያኔ የወጣው ከዚህ ጽኑ አማኒ ማ/ሰብ ነው፡፡ደርሳችሁ ለሃይማት አልባው ደርግ እንኳ ያልሰጣችሁትን ስያሜ አትስጡ፡፡እስኪ ሰው ምን ይለናል በሉ!! እባካችሁ! !ተቋሙ በሰከነ መንፈስና በኃላፊነት የያዘውንና በንግግር ሊፈታ መንገድ የያዘውን አጀንዳ እየጠለፋችሁ የፖለቲካችሁ ማጩዋጩሂያ አታድርጉብን! !ባልተገራ ልሳን ለአክራሪ ብሔርተኞች ጭድ አቀባይ አትሁኑብን! !መጠለያና ደወል ስር ተቀምጣችሁ እየቦጠለቃችሁ ቅጽራችንን አታስደፍሩ! !ከቻላችሁ ሜዳው ሰፊ ነው! !ሀገሩ ትልቅ ነው!!ታገሉ!!ተዋጉ! !ቤቱ ግን የጸሎት ቤት እንጅ የጸብ አይደለም! !የእሬቻ ማክበሪያም አይደለም!! ሁልሽም ለቀቅ!!ልቀቁን!!ተፋቱን!! Brother you are not uderstand the context of the srticles or you are outside the circle. Ready again and sgain or do not to attack personally. Zelabediki, sorry to say! Aha Semegnew, menew TPLF sineka amemeh, Egna eskemnawkew ye Ethiopian Hizb zeregnet yastemarew, bezer yemiyabalaw, Betechristianen selam yasataw TPLF new, musegneten ena lebeneten yemiyaberetata new. Ene kemotku serdo aybekel new! Abo lekek Adergen!!!!!! Mr. Simegnew: You go and tell this rubish idea to your protestant and Tehadiso followers. ምነው ወንድም ሃሳብን እንጂ ሰውን አትቃወሙ እያልክ አንተው ሰውን ከመቃወም አልፈህ ዘላበድክ ማለትህ?! ከላይ ከጻፉት ከሁለቱ ለየትኛው እንደጻፍክ እንኳን ግልጽ አይመስለኝም ለማንኛውም ወንድሜ ይሄ ድህረ ገጽ መማማሪያና ሃሳብን በነጻነት ማንሸራሸሪያ መሆኑን ብትረዳው ጥሩ ነው። የሰውን ክብር መንካት የራስን ያስነጥቃል ሲባል አልሰማህም እስኪ አንተም ደጋግመህ አንብበው እርግጠኛ ነኝ እራስህን ትታዘበዋለህ። በመጨረሻም ለአባባልህ ይቅርታ መጠየቅህም ያዋቂ አጥፊነትህን አይመሰክርብህ ይሆን? 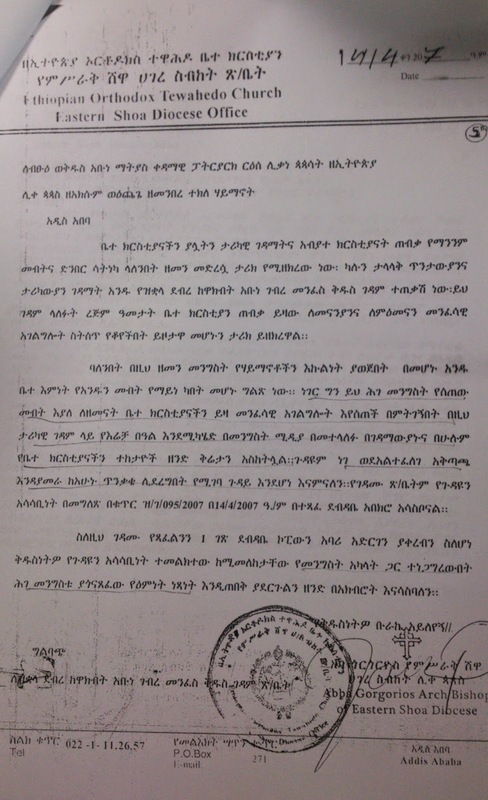 LELET program of TPLF, i think its better to pray to God. እስኪ የውጪው ሲኖዶስ አንዴት ተዋህዶን ኣስጠብቆ አንደኖረ ያስረዱን? ያባይ ጉዳይስ በማንም ዪታሰብ ይታቀድ ግን ለሃገር የሚጠቅም ነው ብለው ኣያስቡም? ejig betam asafari new CHRISTIANNOCH maninetachin weyane siatefa zim anilim! I wonder what the government wants to happen in the country. Are they fueling some kind of religious war andwant to come out as a hero after punishing both sides (or no matter how many factions will come out if this continues). The locals won't have any intention of overturning this historic monastery. this kind of inflammatory concept comes some Cadres in the local government looking for an opportunity to steal the hearts and minds of people in the name of 'ethnic patriotism'. I wish the locals (the people) could sit down and talk...iron out their difference and come up with a working solution ( Non politicized, practical solution). ይህን እኩይ ተግባር ያሰቡትን ልቦና ይሥጥልን። የቅዱሳኑ በረከት ይደርብን...አሜን!!! oh!! this is a complete disregard of the right religion of the people,because the goverment is in a way to determine the place of worship for agiven religion in favor of the other.more over,this is the act of initiating a conflict between the peoples who are living together in good faith. how can the governement allienate the worship place of a given religios inistitution? this is the awkward of the government.so,it is better for the government to shorten its hand from intervininig in religious matter. The remedy forr the problem is removing Woyane Racist from the power. But, you are still (for the last 20 years) beating around the bush. This is your reallity!! What are you going to do? Continue to ignore the real source of the problem? u ediet forget about lucy and think about the real fact ante d\n danieln lemenager first ante man nek ? devil? protestant ? or what? (ውድ የወንጌል ሰባኪ ሆይ) ብለህ ሃሳብህን የሰነዘርከው ወንድሜ፤ የሳፍከው መልዕክት ዘለፋ አዘል ባይሆን ምንኛ ጥሩ ነበር። ይህ ዓይነት ማህበራዊ ድህረ ገጽ መማማሪያና ሃሳብን ማንሸራሸሪያ በሆነ መልኩ ማየትና መገንዘብ ጥሩ ይመስለኛል። ማንኛችንም ብንሆን ከዚህ አሉታዊ (ኔጋቲቭ) አመለካከት የጸዳን ነን ለማለት አልደፍርም። እኔ ግን ከስሜት ነጻ በመሆነ መንገድ መጻፍ ቢያንስ ለህሊና እረፍት ስለሚሰጥ እራሳችንን መግዛት ብንጀምር ጥሩ ነው ለማለት እወዳለሁ። አንተ በስሜት በመጻፍህ ሌሎቹንም በስሜት እንዲጽፉ ያደረገ ይመስለኛል። ሰው ሃሳቡ እንጂ ማንነቱ አይነቀፍም በተጨማሪም ሰውን አለማክበር የራስን ክብር ባጣጣል አይሆንም ትላለህ? ቄሱ፣ መነኩሴው፣ ጳጳሱ፣ ሰባኪው ሁሉ ነገር አሳመርሁ ብሎ ሉሲ ሉሲ ሲል አያስቆጣምን? bereget lucy sew ayedelechem gen mediawochachen Ysew zer megegnea eyalu sebekun. 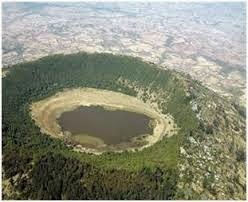 bereget ye Antropology professor Ethiopia the birth place of all human binges eyalu adekunune ayedel? danielem eko hulun awek ayedelem! melekotawim ayedelem! memerochu፣ mediaw Yastemarewun zeref enji. 2. *"ዝቋላ ታሪካዊ የቅድስት ቤተክርስቲያን ሃብት ነው፡፡ ይህንን የክልሉ መንግስትም ሆነ የፌደራሉ መንግስት ሊጠብቁት እንጂ ሊያፈርሱት አይገባም፡፡ የክልሉ መንግስትም ሆነ የፌደራሉ መንግስት በፅሞና ተመልክተውት ለህዝብና ለሀገር ሰላም ሲባል፤ ለሀገር ቅርስ ደህንነትም ሲባል እስከዛሬ ያለውን ታሪክ ሊጠብቁት የጎደለውንም ሊያሟሉለት ይገባል፡፡ የማይመች መንገዱንም ቢቻል በጀት መድበው ሊሱለት (ቢሰሩት) ልማቱንም ሊደግፉት ይገባል እንጂ እውቅና ነፍጎ ለሌላ እምነት እንዲውል መፍቀድ ትክክል አይደለም፡፡*"
ፈጣሪ እንዲህ ዓይነት ሚዛናውያን ሰዎችን ያብዛልን!! !